Project: Harvey Woods Lofts, Woodstock, ON by Indwell Community Homes. Architect: Invizij Architects Inc. Photo: George Qua-Enoo. For more about the articles in this issue! 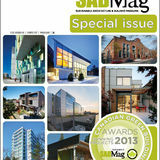 SABMag is a proud member and official media partner of the Canada Green Building Council. of Earth yet published. It is also the most alarming. Together the 91 lead authors and 133 contributing authors drawn from 40 comments in the process of coordinating, collating and analyzing the data. thought, but a figure more than twice that. The print version of SABMag uses Rolland Enviro 100 Satin, a 100% post-consumer fiber that is certified FSC and EcoLogo. It is processed chlorine-free, FSC-recycled and is manufactured using biogas energy. “As leaders, we have a great responsibility toward our citizens to take ambitious action to ensure a safer, healthier, and more prosperous future for all. We can do it, and we must do it.” Let’s have no more cheering from the sidelines. For all of us, the most important resolution for the New Year is to stand up and be counted, to participate in our democratic processes: to take action whenever and wherever we can. Words are no longer enough. JURY NAMED AND 2019 SABMAG CANADIAN GREEN BUILDING AWARDS SET TO GO Register now at https://sabmagazine.com/ awards/register/ to receive your Entry Kit for the 2019 SABMag Canadian Green Building Awards. With nine submission categories, the Awards is a great opportunity to have your work recognized and published in SABMag, and on the SABMag web site and newsletter. Eligible projects must have been substantially completed between January 1, 2016 and February 28, 2019. If you entered a project last year, enter it again. A different jury can bring different results. An entry fee applies only when you make your submission. Deadline for submissions March 8, 2019. Our esteemed jury for 2019 consists of: Lisa Bate, B. Arch, PP OAA, AAA, AIBC, Int’l Assoc AIA, FRAIC, F. RESET AP, PC CaGBC, LEED AP BD+C, ICD.D B+H Regional Managing Principal, North America / WorldGBC Chair Lisa is a thought leader in high-performance sustainable design in architecture and large infrastructure planning and development with a vast portfolio of global work in commercial, mixed use, healthcare, education, sport, and institutional projects. A global ambassador for sustainable design, Lisa is the ViceChair of World Green Building Council's (WorldGBC) Board of Directors, and a Fellow of the Royal Architectural Institute of Canada, and recently was named the 2019 Clean16 winner for the Building – Design, Development & Management sector of the Clean50 Awards recognizing Outstanding Contributors to Clean Capitalism in Canada. Ron Kato ArchitectAIBC MRAIC LEED AP Principal, Kato Martyn Architects Program Head & Faculty, Architectural Science Degree, British Columbia Institute of Technology With over 25 years of practice as an architect, Ron brings his expertise to bear in teaching architectural design to the next generation. Prior to establishing his own firm, he was project architect/ manager at Larry McFarland Architects Ltd. for many of that firm’s significant projects including the first building to be awarded a LEED Platinum certification in Canada – the Gulf Islands National Park Reserve Operations Centre. In 2016, the CaGBC recognized Ron with an Academic Leadership Award in acknowledgement of the CaGBC’s National Student Competition which has now been won by students from Ron’s design studio for seven consecutive years. Jonathan Bisson, architecte, PA LEED, cert. Gestion de projet. Partner, bisson | associés In 1997, Jonathan Bisson and his partner founded the firm bisson | associés and, since then, he has been involved in the planning, design and management of award-winning projects, including sustainable development projects. While running his practice, he has also taken on a mentoring role since 2011 as a lecturer at the School of Architecture of Laval University. He has also made significant contributions to the profession, serving on the Board of Directors of the AAPPQ since 2014, and as Director of the Quebec Region of the Royal Institute of Architecture of Canada since 2015. From 2007 to 2015, he was a member of l'Ordre des architectes du Québec admission committee, and is an evaluator for the Broadly Experienced Foreign Architect (BEFA) Program, implemented by the Canadian Architectural Certification Board. 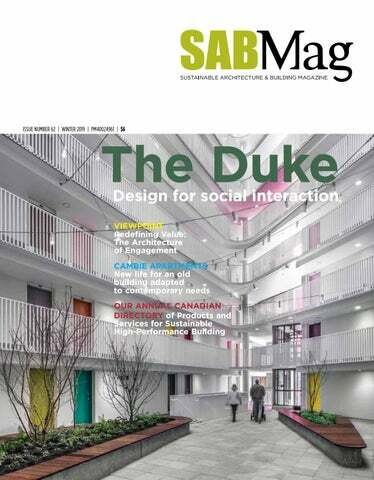 SUSTAINABLE DESIGN IN THE REGIONS: LATEST CAGBC FOCUS PUBLICATIONS FOR BC, ALBERTA, TORONTO AND THE ATLANTIC The latest CaGBC Chapter FOCUS publications published with SABMag for BC, Alberta, Toronto and the Atlantic cover local green building projects, events and activities. The 2018 Atlantic FOCUS gives a concise tour of developments in sustainable building through recent projects such as a multi-unit residential Passive House retrofit, a sustainably designed winery, New Brunswick’s largest PV installation and programs such as Green Net Zero that are making a difference. The Alberta FOCUS covers the new Rogers Place NHL rink in Edmonton, LEED certification of a high-rise development in Calgary, and conservation programs from Energy Efficiency Alberta. Toronto FOCUS looks at Better Housing through Intensification, the 70-acre West 5 Net Zero Energy Community, and the Next steps for LEED v4.1, among others. The Fall BC FOCUS reviews leading-edge highperformance buildings such as the award-winning Langara College Science & Technology Building and the Cambie Fire Hall No. 3, the new ZEBx Centre, the BC Energy Step Code, and changes coming to LEED: O+M. To view digital versions of the CaGBC FOCUS publications, go to www.cagbc.org, select ‘Chapters’, and go to the BC, Alberta, Toronto and Atlantic Chapters to find the links to the FOCUS publications. Readers wishing to receive print copies should make a request to lcadieux@sabmagazine.com. CAGBC ZERO CARBON BUILDING PROGRAM celebrates key achievements as it works to push industry toward greater sustainability By Fin MacDonald, Manager, Zero Carbon Building Program, Canada Green Building Council After one year of operation, the Canada Green Building Council (CaGBC)’s Zero Carbon Building (ZCB) Program is celebrating several milestones and working hard to bring critical new tools and resources to the market. Pilot Program participants, an additional 10 projects have registered to pursue certification. Program participant, was the first project to achieve ZCB-Design certification in April 2018.
made for buildings that contribute no net carbon emissions to the atmosphere. In May 2018, Mohawk College’s Joyce Centre for Partnership & Innovation in Hamilton became the second project and the first institutional building in Canada to earn ZCB-Design certification. The facility is now serving as a laboratory for the next generation of green building and renewable energy professionals. 1 - The project evolv1, a commercial office building in Waterloo, Ontario and a ZCB Pilot Program participant, was the first project to achieve ZCB-Design certification in April 2018. The Cora Group; designed by Stantec. Architects have long believed that we add significant value: we improve things, we take under-utilized sites and buildings and help to transform them to a higher and better use. At least that is our aim. pose, and a commitment to accountability. inequality, the unravelling of the social fabric, and political isolationism. At a time when consensus-building and cooperation are most critical to our future resilience, we find them in increasingly short supply. While remaining a vital part of the solution, the conventional green building movement has not ventured far from its core mandate to measure and mitigate the environmental impact of buildings. 1 - Darryl Condon, Managing Principal, HCMA Architecture + Design. 2 - The Shepard Environmental Education Centre, and the constructed wetland that surrounds it, are part of Calgaryâ&#x20AC;&#x2122;s new stormwater management and flood prevention strategy. (Photo: Charles Hope, courtesy Simpson Roberts Architects). 3 - 60 Richmond East combines co-op housing, teaching facilities and a training restaurant for hospitality workers in Downtown Toronto. The planted terrace is used to grow herbs for the restaurant (Photo: Shai Gil, courtesy Teeple Architects Inc.). By Felix Leicher Located on a leafy street in the Beaches area of Toronto, near shops, restaurants, schools and parks, this open concept home was specifically designed to minimize the carbon footprint of the building over its life cycle. thus reducing the heat island effect. 1 - The west (front) elevation. Windows and sliding doors, all with fiberglass frames, supplied by Inline Fiberglass. 2 - The east (rear) elevation. during cool nights in the shoulder seasons. Cambie Apartments New life for an old building adapted to contemporary needs BY TRAVIS HANKS With its modest street presence, the 1920s three-storey walk-up might be easy to miss along the ‘Cambie Corridor,’ a major arterial route in Vancouver that has seen massive densification since the completion of the Canada Line subway in 2009. At a time when buildings are disappearing along arterials, Haeccity Studio Architecture saw a rare opportunity to capture the embodied energy of the existing structure, and ensure these homes would flourish into a new era. involved a comprehensive upgrade of all systems and building envelope (mineral wool insulation with extruded polystyrene (XPS) at foundations and an inverted XPS roof) for increased energy efficiency. A total renovation of all interiors included a more effective suite layout that resulted in an additional five units as well as new shared amenity spaces. By consolidating antiquated living spaces and corridors, the 14 existing units were reconfigured to accommodate 19 units, ranging from studios to two-bedroom units, without adding to the building footprint. Bayview Cycle Centre Bike Up Biogreen Systems Ltd. Busch Systems Ltd. Carmanah Technologies Champagne Edition Inc. Colbond Inc. Contech Construction Products Inc.
D. Litchfield & Co Ltd.
STORMWATER Aqua-Tex Scientific Consulting Ltd.
MOLOK® DEEP COLLECTION™ SYSTEM The Molok® Deep Collection™ system is an award-winning semiunderground waste containment system. Twenty years in North America and emptied by crane, Molok® containers are space saving, efficient and odour free. Butler Buildings CanadaCanadian Brass and Copper Co.
RADON MITIGATION Radon Environmental Management Corp.
G.E.M. Inc. manufactures Euroshield®, environmentally friendly recycled rubber roofing products from a facility located in Calgary, Alberta. Vermont Slate SC (shown above) is the latest product release and the world’s first Hail Proof Roof material. Warranty coverage for ANY size hail impact. Award-winning Harvey Woods Lofts by Invizij Architects Inc.
Dura Foam/Canadian Industrial Distributors Inc.
Durisol Building Systems Inc. Emercor Ltd. Good Shepard Wool Insulation Icynene Insulation Igloo Cellulose Inc.
Louiseville Specialty Products Magwall Inc.
Hunter Douglas Canada Ltd. McGill Architectural Products MechoShade Systems, Inc.
Solatube International Inc. Thermotech Windows Ltd.
Interstyle ceramic + glass ltd.
Upper Canada Treasured TimbersForest Inc. Products Ltd.
Upper Canada Forest Products Ltd.
LEED v4 Category potential for New Construction, Major Renovations and Homes for energy performance. Lutron Optimum Energy Products Ltd.
Lochinvar/Aqua-Tech Sales and Marketing Inc. Mammoth-WEBCO Inc.
Groundheat Systems HeatLink Group Inc. Ice Kube systems Ltd. NextEnergy Inc. WaterFurnace Int’l Inc.
BP Solar CARMA Industries Inc. Carmanah Technologies Corp.
Rheem Canada Ltd. Taco Takagi Canada, Inc. Uponor Ltd.
ELECTRICAL | PLUMBING | HVAC | RENEWABLES SOLAR PV WATER -TREATMENT Bullfrog Canplas Power Inc. BP Solar Bord na Mona Inc. CARMA Inc. BradfordIndustries White Canada Carmanah Judo waterTechnologies Treatment Inc. Corp. RH20 North America Inc. GE Industrial Waterloo Biofilter Systems Inc.PV Generation Menova Energy Inc.
Solar-Max Heating Systems Inc. Simple Solar SunPump Solar Inc. Viessmann Manufacturing Company Inc.
WATER TREATMENT Canplas Bord na Mona Inc. Bradford White Canada Judo Water Treatment Inc. RH20 North America Inc. Waterloo Biofilter Systems Inc.
WIND Bullfrog Power Inc. Cleanfield Energy Corp.
TEMPEFF NORTH AMERICA Tempeff North America manufactures Semi-Custom air to air energy recovery equipment with up to 90% energy efficiency in winter without any requirement for an energy robbing defrost strategy. DESIGN PROFESSIONALS: LIST YOUR SERVICES IN OUR 2019 WEB DIRECTORY. You'll receive the same benefits as noted below. Curtiss Dining Hall, CFB Borden*, in JV with ZAS. Photo: © Brenda Liu. . The Canadian Precast/Prestressed Concrete Institute (CPCI) and the Canadian Concrete Pipe and Precast Association (CCPPA) are pleased to announce a new joint venture to establish an independent entity for an enhanced and expanded third-party administered and audited certification program for both prestressed and non-prestressed precast concrete manufacturing facilities across Canada. The new Canadian Precast Concrete Quality Assurance (CPCQA) Certification Program will be more effective, independent and transparent. Environmentally responsive and holistic engineering As advocates for sustainable design, RJC’s passion and commitment to responsive and responsible design is embedded into our everyday engineering practice. You'll receive: - your listing is also mentioned and linked in one of the SABMag monthly e-News, - your listing will go on both the SABMag home page, and Facebook page for one month with a link to your site, and - your listing is mentioned and linked in all of our publications [10 in total] throughout 2019. The Awards presentation of the 2018 Canadian Green Building Awards, the annual program of Sustainable Architecture & Building [SABMag], took place in Toronto on June 4, 2018 where the winning firms were recognized. We especially thank our sponsors who make the Awards possible. Once construction begins, developers begin their first phase of implementing their plan for meeting CBA obligations. The post construction operations stage is dependent upon the type of project, but many developers and building management companies should continue to provide community benefits throughout the lifespan of the project. Compliance to meet the legally binding CBAs vary from case to case using a range of incentives including surety bonds and municipal permit covenants. 1 - Vancouver’s Parq Casino was used as a pilot project for the Social Value Scorecard. The Community Benefit Agreement included provisions for targeted employment during both construction and operation phases. GoToVan from Vancouver Canada/Wikimedia Commons, Commons. To read the Parq Casino CBA case study, see the link in the Case Study section of this article. part of a major infrastructure or land development project. ment projects, a per-project based process is required. and what will be the agreed upon measurable outcomes. developers) involved in or affected by a development project. own or with support from a process facilitator. INTERVIEW WITH PCL’s new Director, Sustainability, Scott Beckman PCL Construction [pcl.com] is a group of independent construction companies working in the U.S., Canada, the Caribbean, and in Australia. Its operations in the civil infrastructure, heavy industrial, and buildings markets amount to an annual construction volume of more than $8 billion, making PCL one of the largest contracting organizations in North America. veloping high performance low impact building solutions for our clients. ers and the owner of the best options to meet their needs. tomatically turn off the heat in unused rooms or areas of a building. which means PCL is responsible for all aspects of sustainability. more comfortable and productive work environment. best choices based on life cycle cost and energy efficiency. tices internally. What is PCL doing in that regard? SABMag: What do you see as your role as Director, Sustainability? touch by identifying opportunities for high-performance construction. ducing those greenhouse gas emissions. contribution to sustainable building in the coming years? energy, material, and water consumption. have in ensuring or improving the sustainable aspects of a project? .ca Visit www.cpci.ca/publications to download your free copies of the Mitigate and Adapt Building our Communities in the Age of Climate Change brochure and the Structural Solutions technical publication.